The iconic dance-step keeps on kickin’ in halls and honky-tonks across the state. I step and glide with my dance partner, Susi, while whispering, “Quick-quick…slow…slow.” It helps to count out the steps since Susi’s new to two-stepping and I’m no urban cowboy. We find our stride and circle the dance floor, spinning around as if riding a carousel. One of the oldest dance halls in Texas, Twin Sisters dates to 1870. Six generations of local families belonging to the Twin Sisters Hall Club have preserved not only the original tin-sided building, but also a Texas heritage of traditional country dancing. The band starts another song, and couples flood the dance floor. Teenage boys sporting saucer-sized belt buckles pair up with girls clad in blue-jean shorts and red cowboy boots. Silver-haired gentlemen in pressed Wranglers and white western shirts step lively with graceful ladies in flouncy cowgirl skirts. Grade-schoolers in boots and cowboy hats kick up their heels. Texans love their icons, from Longhorn cattle and longnecks to Bob Wills and Willie Nelson. Add to the list the Texas two-step, the most popular country dance in the nation. Although Texas has designated the square dance as its official state folk dance, the two-step rules in honky-tonks and dance halls around the state. Along with country music, the two-step has a timeless appeal that transcends generations and geography. Casual, fun, and simple, the two-step is easy to learn for people of all ages and abilities, and it’s one of those activities you don’t need to be good at to enjoy. Most country dance patterns use some type of two-step or “shuffle-step” footwork, often mixed with spins and turns borrowed from swing dancing. Good two-steppers move gracefully and quickly around the dance floor. They keep the upper body still, with minimal Elvis-style hip movements and other flourishes. Basic two-step footwork begins with two quick steps followed by two slow steps danced in six counts to a four-count rhythm. 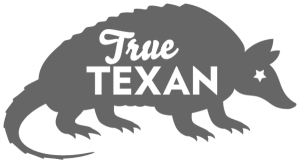 Two-stepping couples progress counterclockwise around the dance floor—the leader takes forward steps; the follower backward steps that mirror the partner’s moves. Sounds simple? It should be, except everyone has his or her own idiosyncratic style of two-stepping. Just like making chili or margaritas, two-steppers concoct endless variations from the same basic ingredients. In addition to the traditional Texas two-step with its side-to-side shuffling, there’s the progressive two-step (a simple walk with a quick-quick skip), the nearly stationary Arizona two-step (or rhythm two-step), the California two-step (or nightclub two-step, popular in discos), and the triple two-step (a.k.a., the Fort Worth shuffle), which blends rapid, polka-style triple steps with a fast walk. Today’s two-step dance originated with the collegiate foxtrot in the 1920s, which used brisk, hopping “slow-slow, quick-quick” steps. The collegiate foxtrot grew tamer over time, replacing the hops with a smooth, flat-footed gliding motion used in today’s two-step. Eventually adopted by the square dance and country dance world, the original foxtrot became known as the “country foxtrot” and the Texas two-step. “The two-step is really the poor man’s foxtrot,” confirms Peter Turner, a dance instructor at Texas State University in San Marcos with a self-taught “Ph.D. in honky-tonking.” According to Turner, two-stepping and swing dancing go together like chips and salsa. “You can apply all the turns, spins, and pretzels of East Coast swing to two-stepping,” he says. From the 1930s through the 1950s, millions of Americans danced to Western Swing music in honky-tonks and dance halls. The legendary Texas fiddler Bob Wills became instrumental in this country dance renaissance. His infectious, jazz-inspired fiddle music got countless couples out on the floor dancing the Lindy Hop, schottische, western-style jitterbug, and two-step. Interest in country dancing waned with the rise of rock’n’roll in the 1950s and ’60s, followed by disco fever in the ’70s. As the disco craze peaked, America embraced country music again like a long-lost lover. The 1980 film Urban Cowboy, starring John Travolta and Debra Winger and set in Gilley’s in Pasadena, Texas, triggered a fascination with kicker culture. Billed as the world’s largest honky-tonk, Gilley’s brought country dancing to the national stage. 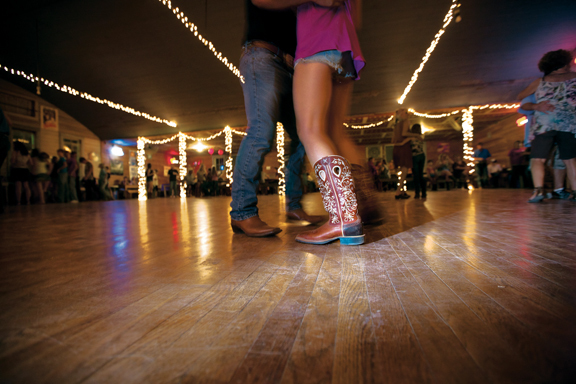 Nowadays, two-stepping aficionados point their boots to traditional dance halls and honky-tonks such as Floore’s near San Antonio, Blanco’s in Houston, The Stagecoach Ballroom in Fort Worth, and a bevy of old-time dance halls in small towns like Albert, Anhalt, Coupland, Gruene, Kendalia, and Luckenbach. If you like dancing alfresco, slip a coin into the juke box and two-step the night away at Garner State Park’s outdoor dance pavilion, which has hosted juke-box dances every summer night since the late 1930s. Or scoot over to Crider’s Rodeo and Dance Hall on the banks of the Guadalupe River near Hunt. The Crider family hosted their first rodeo and dance in 1925, and the tradition lives on with dances held every Saturday night from Memorial Day to Labor Day. When twilight falls, the rodeo crowd pours into the dance pavilion, the band starts playing, and two-steppers glide around the dance slab dusted with cornmeal. It’s two-stepping paradise beneath a starry sky. After learning the basics, I progressed from shuffling to Patsy Cline and Willie Nelson CDs in my living room to two-stepping to live music by the Cornell Hurd Band, James Hand, Dale Watson, and Bruce Robison at Austin’s Broken Spoke. Established in 1964 by James M. White and hailed by Texas Highways readers as “the best honky-tonk in Texas,” the Broken Spoke has stayed true to its country roots for more than two generations. “The Spoke has survived because James White has good taste in dance bands and dance music,” says retired country musician Tommy X Hancock. Hancock enjoys dancing in Austin honky-tonks, preferably barefoot or in socks. “That’s the country way of dancing,” says Hancock, author of Zen and the Art of the Texas Two-Step, a quirky, occasionally randy primer on country dance etiquette. For a fun and easy introduction to two-stepping, I take one of Terri White’s dance lessons at the Spoke, held four nights a week. “I teach what I call the Broken Spoke swing—the classic two-step from the 1930s with some swing mixed in,” says Terri, James White’s eldest daughter. Maverick country traditionalist Dale Watson also understands this feedback loop between dancer and performer. Raised in Pasadena, the Texas troubadour cut his musical teeth at Gilley’s. When he’s not touring the U.S. or Europe, he loves performing to dance crowds in Texas honky-tonks like Ginny’s Little Longhorn Saloon, an Austin tradition for decades. Watson plays at Ginny’s most Sunday afternoons during Chicken S**t Bingo, Watson’s zany contribution to “Keep Austin Weird.” Tattooed bikers, Prius owners, cowboys, rockabillies, blue collars, students, and boomers pack Ginny’s when Watson performs, with just enough space in front of the band for a few dancing couples. Not all of them can do a proper two-step.